HeatWatch is a hardware and software system to measure the temperatures, determine temperature differences, and calculate maturity values at critical locations during hardening of concrete in a structure. It forms the third part of a thermal control system that also includes B4Cast and HeatBox. HeatWatch also allows strength estimation at early ages, provided the strength-maturity relationship for the concrete mixture used in the structure has been established and entered into the HeatWatch computer program. HeatWatch can be used to verify predictions of temperature development in a newly cast member based on using a thermal analysis program, such as B4Cast. Alarms stored in the HeatWatch program can be used to alert the user if preset temperature limits or limiting temperature differences have been exceeded. The alerts can be sent as text messages to the user’s mobile phone. HeatWatch can perform other monitoring and surveillance tasks such as recording wind speed, relative humidity, barometric pressure, water levels, strains, corrosion parameters, and crack movement. 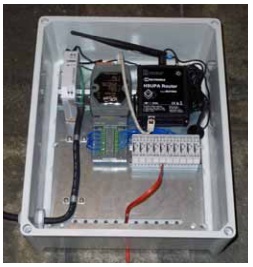 Any sensor providing an appropriate electrical output can be monitored. 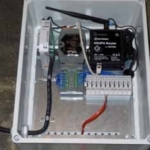 The HeatWatch system comprises on onsite datalogger, hardware for connecting the datalogger to the Internet, and software to set up the project, make calculations, and display results. 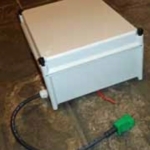 Thermocouples are installed at pre- established locations in the structure and connected to the data logger. The HeatWatch software is installed on a host computer with a Windows® operating system. Temperatures are recorded by the data logger at desired time intervals from the time of concrete placement. As indicated in the schematic below, data are transferred continuously to the host computer using a GSM router to connect the datalogger to the Internet. Alternatively, data can be transferred to the host computer via a wireless local area network (LAN). Thus the user is able to monitor in real-time the in-place temperature conditions of the remote structure. HeatWatch makes use of the Short Message Service (SMS) protocol and can be set up to send text messages to a mobile phone if user-defined limits are exceeded. The maturity method is a technique to estimate in-place strength after casting by accounting for the effects of temperature and time on the strength gain of concrete. The use of the method is described in ASTM C1074 “Practice for Estimating Concrete Strength by the Maturity Method.” The temperature history of the concrete and a maturity function are used to calculate a maturity index that quantifies the combined effects of time and temperature. The strength of a particular concrete mixture is expressed as a function of its maturity index by means of a strength-maturity relationship. If portions of the same concrete are subjected to different temperature conditions, the strength-maturity relationship for that concrete and the temperature histories measured at the different locations in the structures can be used to estimate in-place strengths at those locations. The exponential function is an age conversion factor that converts a time interval at the actual concrete temperature to an equivalent time interval, in terms of strength gain, at the reference temperature. The reference temperature is usually taken as the standard-curing temperature for concrete specimens, which is typically 20 °C (293 K) or 23 °C (296 K). Note that absolute temperature in Kelvin is used in the age conversion factor expression. The activation energy represents the temperature sensitivity of the rate of strength gain during the acceleratory period following final setting, and it depends on the cementitious materials in the concrete. For ordinary portland cement it has a value of about 40 kJ/mol, and it is greater for mixtures with slag cement and smaller for mixtures with fly ash (1, 2). ASTM C1074 provides strength-testing procedures for estimating the activation energy for a specific cementitious system. Others have used isothermal calorimetry (2) and setting time tests to evaluate activation energy (3). To use the maturity method for estimating in-place strength, it is necessary to develop the strength-maturity relationship for the particular concrete mixture. As described in ASTM C1074, this can be done by measuring the strength of specimens of the concrete mixture at different values of maturity. The strength-maturity data can be entered into the HeatWatch program, and used for estimating the strength as a function of age at the thermocouple locations. The activation energy for the concrete can also be provided as input to the program. The HeatWatch system comprises a web-based datalogger, a GSM router, a power supply, temperature sensors, and software. 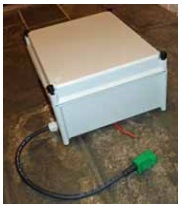 The datalogger and router are housed in a rugged 300 x 150 x 380 mm box. 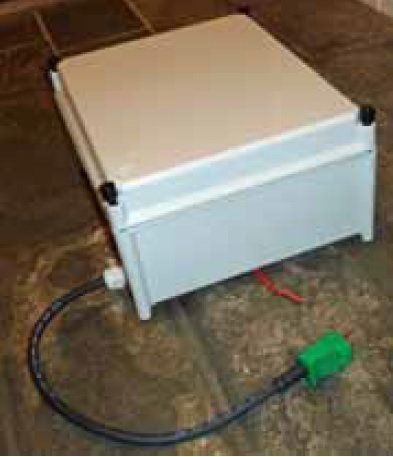 A heating element is included to protect the electronics during freezing conditions. The basic datalogger can accommodate up to 10 sensors, but a system with a larger number of channels can be configured by special order. 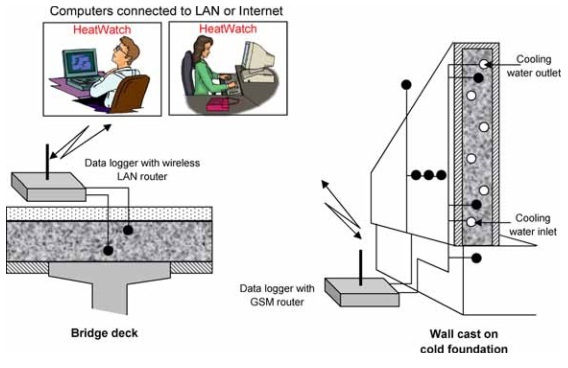 The GSM router provides a connection to the Internet, by which the sensor data are sent continuously to a host computer at a remote location that is running the HeatWatch program. The user has to supply a SIM card for the router. The sampling rate for temperature measurement is established through the host computer. As temperature data are acquired, they are stored and displayed on the host computer. Temperatures are measured at critical locations, as determined from a thermal analysis using, for example, the B4Cast software. The temperature sensors are low cost thermocouples that are fastened to formwork or reinforcement. 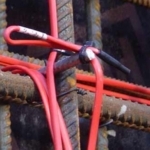 Care is needed to ensure that the thermocouples become embedded in the fresh concrete and are not in direct contact with reinforcement or other embedments, which might result in false indications of concrete temperature. 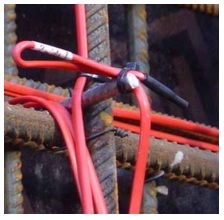 Also the wires need to be protected so that they are not severed during concrete placement and during consolidation with internal vibrators. The HeatWatch software provides flexibility in what can be done with the acquired temperature data. Temperatures from different channels can be added, subtracted, or averaged. This makes it easy to keep track of temperature differentials between interior and exterior locations at critical cross sections. Limits can be placed on maximum temperature, minimum temperature, temperature differences, maturity values, and estimated values of in-place strength. The user can instruct the program to send text message alerts when any of the defined limits are exceeded. If prescribed temperature limits are exceeded, the warning will allow an opportunity to take remedial actions before irreversible damage occurs. Notification that adequate in-place strength has been attained permits the field engineer to allow formwork removal or application of post-tensioning in a timely fashion. The end result is rapid construction without compromising safety. Each channel, which corresponds to a specific location in the structure, can be assigned “material properties.” The material properties include the activation energy and the strength -maturity relationship of the concrete. While it is common to makes estimates of compressive strength development, tensile strength development may be more critical when trying to prevent thermally-induced cracks. For this purpose, the user may wish to prepare a tensile-strength versus maturity relationship, which can be developed using indirect tension tests. The above figure is an example of the graphical displays that can be produced using the HeatWatch software. The graph on the left shows the temperature histories of four channels. The graph on the right shows the temperature history at one location (or channel) in red, the equivalent age as a function of actual age in light green, and compressive strength development as a function of actual age in blue. The latter two curves are made possible by defining the “material properties” for this channel, which include the activation energy needed to convert actual age to equivalent age and the strength-maturity relationship for estimating strength gain. Printed copies of the graphs can also be prepared for documenting the results of the monitoring program. Warning: It is important to realize that, when strength is estimated based on the in- place maturity, it is assumed that the concrete in the structure is the same concrete as was used to develop the strength-maturity relationship and that the concrete has been consolidated and cured properly. Whenever executing critical construction operations based on having achieved the required in-place strength, additional information is needed to ensure that the estimated strength has in fact been attained. Refer to ASTM C1074 for additional guidance. Data logger with 10 channels. Additional channels are optional. Schindler, A.K., “Effect of Temperature on Hydration of Cementitious Materials,” ACI Materials Journal, Vo. 101, No1, Jan-Feb 2004, pp. 72-81. Pinto, R.C.A. and Schindler, A.K., “Unified modeling of setting and strength development,” Cement and Concrete Research, Vol. 40, 2010, pp. 58-65.